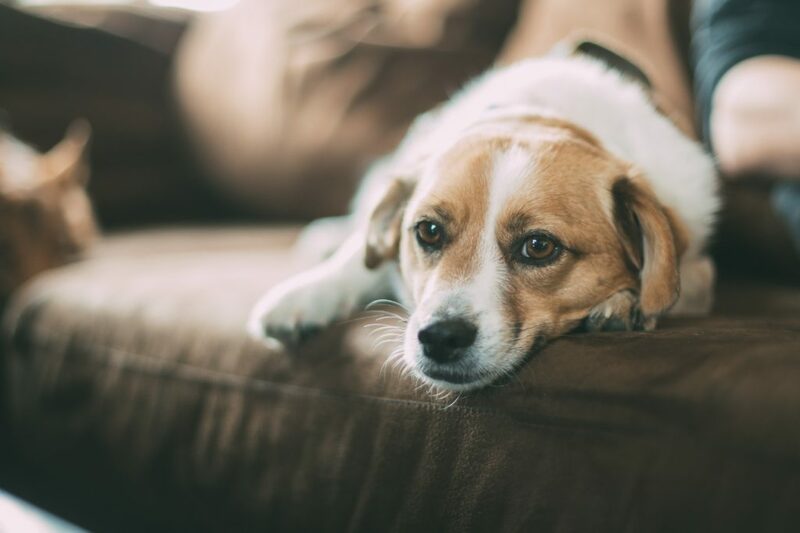 Whether caused by an accident, disease, old age, or a combination of any of those factors, it is difficult for pet owners to watch their canine companion lose partial or complete mobility – even temporarily. Sadly, the loss of mobility continues to be the leading cause of euthanasia among senior dogs today – even when they are still happy, responsive, alert and otherwise healthy. While procedures such as hip replacement or spinal surgery can help with mobility issues caused by certain conditions, they can be very expensive. Thankfully, there are other options available (widely used in animal rehabilitation practices) that can increase a mobility-challenged dog’s longevity and improve its quality of life: the dog wheelchair. 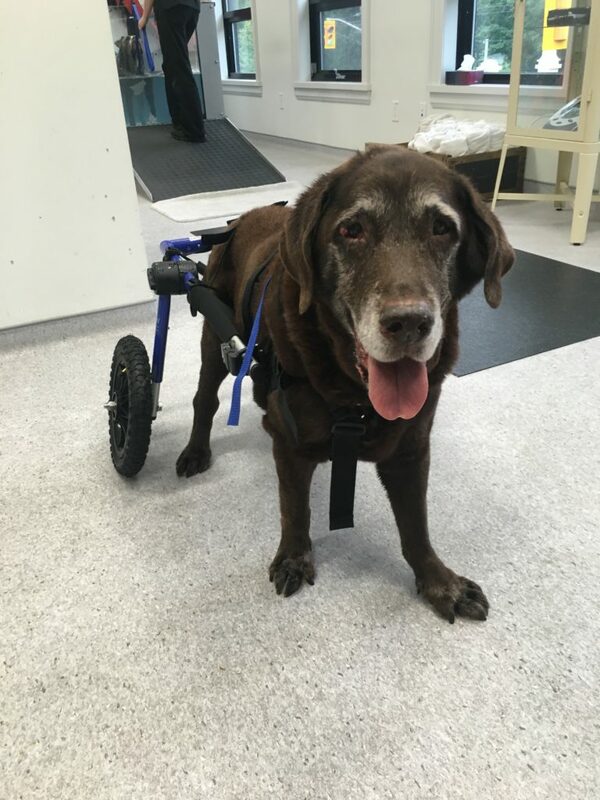 Dog wheelchairs can make a world of difference for dogs recovering from surgery or injury; and for some dogs suffering from general limb weakness, paralysis or otherwise painless diseases, they can be life-changing, enabling them to still go for walks and maintain some sense of independence. So when, and why, would your dog need a wheelchair? Read on to detect the signs of mobility issues in your dog and understand how a wheelchair can sometimes help with rehabilitation and aid in the recovery from certain conditions. Mobility problems can afflict our four-legged friends in several ways; and although this condition is more frequent in senior dogs, their mobility can also be compromised due to illness, physical trauma, or neurological issues. When pain is present, a dog experiencing mobility issues may yelp or groan when attempting to move, or may be reluctant to get up or to exercise. Some injuries may also damage the bones, joints or muscles, which can lead to discomfort and difficulty moving; and although many of the wounds that may compromise mobility eventually heal, there are some that can cause permanent damage and mobility loss. However, there are also painless conditions that may cause dogs to lose partial or complete mobility, such as paralysis due to neurological disorders or spinal damage. seems to be struggling a great deal with walking or getting up. drags its hind legs, has trouble climbing stairs or sitting down without collapsing. crosses its legs in a scissor-like motion. 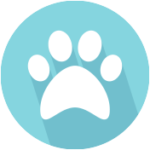 Once a diagnosis is established, the pet specialist will recommend a course of action and may refer you to a canine rehabilitation expert for a holistic treatment approach. While some conditions, like uncomplicated back or leg injuries, benign tumors, and even some neurological diseases may be reversible or curable, others are only treated to manage symptoms and to impede the progression of the disability. In many of those cases, animal rehabilitation and therapeutic tools such as canine wheelchairs can offer your dog a second chance at a happy life. Ligament or joint injuries: Surgery is often used to correct severe ligament and joint injuries, or skeletal diseases such as hip dysplasia. When used in post-operative care, a dog wheelchair can speed up recovery by taking pressure off the surgically repaired hips, limbs or articulations. Spinal cord disorders: spinal diseases in certain dog breeds can lead to nerve damage, rear limb weakness, and sometimes paralysis. It is a common medical condition for which a dog may need a canine wheelchair to aid in rehabilitation. A dog wheelchair can help by taking stress and strain off both the legs, while still keeping your dog active and happy. Arthritis: While medication can certainly help control arthritis (a common affliction in older dogs), a dog wheelchair can also provide great relief and reduce arthritic pain by keeping tension off the afflicted joints and slowing down their deterioration. 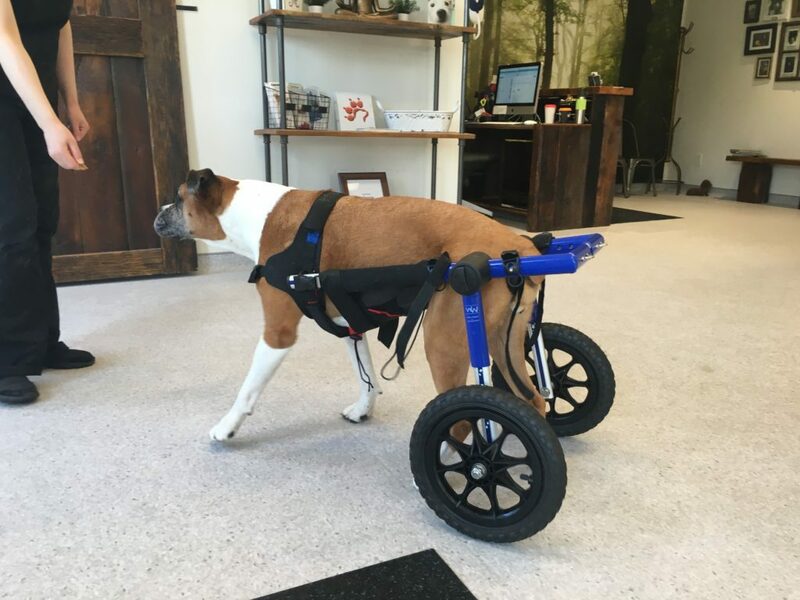 Amputation: Whether the result of an accident, injury or infection, an amputation can be devastating, but an amputated dog can find mobility again thanks to a dog wheelchair, with slings allowing the wheels to do what the legs can no longer provide. Just because your dog has lost or diminished the use of its legs doesn’t mean that life for your furry friend is over. Today’s animal rehabilitation practices include an array of therapeutic devices designed specifically for mobility-challenged or disabled dogs. Certified canine rehabilitation practitioners can determine if a dog wheelchair is right for your dog, and if so, they can help you choose the right one, assist your dog throughout the adjustment period and provide follow-up support, in the short or long term.